As a devout munro bagger (that was last year I am trying to get over it! ), the idea of trekking up a hill just for a bit of peace and some nice scenery seemed like a bit of an odd concept. However, as part of my munro therapy, Ben Cleuch in the Ochils, brought me back to basics with a good leg stretcher and plenty of solitude. It was refreshing to get to the top of a hill and not to have to share it with avid "tickers" who insist on touching the very top stone on the cairn before they consider the hill conquered. This hillwalk starts from Tillicoultry, lying a few miles outside Stirling, hence there is no need to build a 2 hour car journey into walking time. The views from the top were refreshing, with Ben Vorlich and Stuc a' Chroin clearly visible to the NW and to the south the winding Forth could be truly appreciated. Park in the carpark at GR914975. From the carpark follow the woodland path North which leads up the Mill Glen. Continue North along the clear path that gradually changes into a grassy track that leads up the long steady pull to the The Law (638m, GR910997). This part of the walk is sufficient to put a burn in the fittest of thighs so just because it's not a munro doesn't mean it's easy. 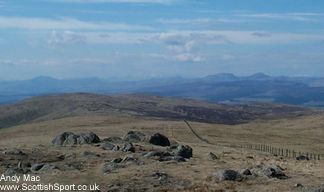 From The Law it's approximately 11/2km NW to the summit of Ben Cleuch (721m, GR903007). 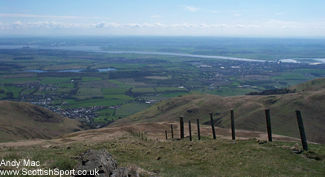 At the summit there are great views of the Forth Valley to the south and summit mounted guide helps identify the towns to the south and the hills to the north. From Ben Cleuch the easiest option is to return back the same way that you came up. Alternatively it is straightforward to continue west then SW over the summit of Ben Ever before continuing down along the track SW. If you choose the second option, care is required at the top of the quarry (dont be tempted to climb over the fence as the quarry face is severe), at this point I continued along the zig zagging grassy track that led eastwards back to the main pathway and then down through Mill Glen to the car. There is some lovely hillwalking in the Ochils, and it's just a shame that many tend to focus on the bigger hills that Scotland has to offer. This area has great views and many interlinking walks that are literally on the doorsteps of Cental Scotland. I fully intend to get to know these hills better in the coming months... and I'm not even going to have to book full day expeditions to do it.